McCafé has lots of offerings. Keep in mind, Premium Roast Iced Coffee is served with light cream and your choice of liquid sugar or flavored (hazelnut, vanilla or caramel) syrups. A small, with liquid sugar (and cream), is 140 calories. A medium is 190 calories and a large is 270. A small McCafé Frappé Chocolate Chip is 420 calories, medium is 620 calories, and the large is a whopping 750 calories. McCafé Frappé Mocha ranges from 440 to 670 calories. McCafé Iced Caramel Mocha is 270 to 450. They’ve also added a line of smoothies made with real fruit, but that doesn’t mean the smoothies don’t also have other ingredients such as added sugar. Smoothies and McDonald’s other flavored drinks (Chillers, lemonade, etc.) range from approximately 210 to 340 calories, depending on size. Best Bet: Order the Premium Iced Coffee plain, add non-fat milk, and try it without sugar or go light on the sugar. BK has several iced coffee drinks and uses Seattle’s Best Coffee. Like McDonald’s, they add sugar and cream to their iced coffee. The calories for the plain iced coffee range from 130 to 230. The Caramel and Mocha Frappés are 410 to 600. 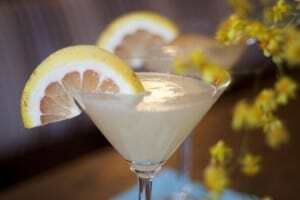 The frozen lemonade ranges from 70 to 100 calories, and the smoothies range from 20 to 450 calories. Iced tea is 120 to 240. Best Bet: Order the iced coffee without milk or sugar, or the unsweetened tea. Wendy’s has a line of FruitTea Chillers made with organic green tea, fruit purée, and juice. The flavors include Blueberry Pineapple and Orange Mango at 170 to 330 calories. While these sound interesting, I’m not sure how they fit into your diet – perhaps as a treat instead of ice cream? There’s an All-Natural Lemonade, which ranges from 150 to 280 calories, and Honest Green Tea, which has from 60 to 130 calories. Also, they promote the lemonade as somewhat healthy and natural, but all these drinks have added sugar. I like the idea that Wendy’s is trying to promote natural ingredients, but these are relatively high in calories. Also, watch out for those Frosty shakes; they’re high in calories and should always be considered dessert. Best Bet: Brewed Unsweetened Iced Tea, which has no calories, or a small Honest Tropical Green Tea at 60 calories. DD is really the co-king of beverages (along with Starbucks). They recently launched an iced green tea, which ranges from 5 to 150 calories. DD also has an Oreo and Chips Ahoy Swirl Iced Coffee, which it’s promoting as 110 to 340 calories. Stay away from most of the fancier drinks that are obviously high in calories. The Coolatta, for example, can have as many as 990 calories­more than 50 percent of what most people should consume in a day. DD no longer has flavored brewed coffee; instead they add high-calorie shots or swirls – too bad. The White Chocolate Raspberry or Caramel Mocha, for example, have 180 calories for a medium black iced coffee with no other sweetener). Also, stay clear of “swirls” such as butter pecan, hazelnut, French vanilla, rocky road, cookie dough, and Oreo. Best Bets: DD does offer sugar-free versions of the following, if you don’t mind artificial sweeteners: Blueberry, Caramel, Coconut, French Vanilla, Hazelnut, Raspberry and Toasted Almond. A small iced coffee would be about 10 to 15 calories for the shot of flavoring. They also offer almond milk and non-fat milk; use those if you don’t take your coffee black. Try to just get plain black iced coffee, sweeten yourself, and add a dash of skim milk. Starbucks is known for creating the coffee culture as well as for serving high-calorie coffee drinks. Its latest drink releases are Frappuccino Fan Flavors that range from 350 to 510 calories. It has also launched S’mores Frappuccino Blended Coffee (500 caloriesfor16 ounces) and Caramel Ribbon Crunch Frappuccino Blended Coffee (480 calories for 16 ounces). Their Fizzio Handcrafted Sodas are also new and may seem healthy, but they’re not; 16 ounces have 100 calories. Here are a few examples of other high calorie drinks from Starbucks: Iced Caffè Mocha and Iced Caramel Macchiato (16 ounces with 2 percent milk and no whipped cream have 230 calories), and an Iced Tiramisu Latte (16 ounces with 2 percent milk and no whipped cream have 190 calories). In case you didn’t already know, almost none the Frappuccinos and other fancy drinks are healthy choices. Best Bets: Go for a mix of Teavana Black Shaken Iced Tea and Shaken Teavana Iced Passion Tea; both are unsweetened and very tasty with zero calories. Or you can go for the 12-ounce version of the Teavana Black Shaken Iced Tea with Lemonade (also unsweetened) for 35 calories. The Very Berry Hibiscus Refresher, made with fruit juice, blackberries and Green Coffee Extract, is 70 calories for 16 ounces. There is also a Cool Lime Starbucks Refresher, made with citrus fruit juice, mint, and a lime slice, shaken with Green Coffee Extract, which is 50 calories for 16 ounces. Or try the Iced Caffè Americano at 15 calories for 16 ounces. 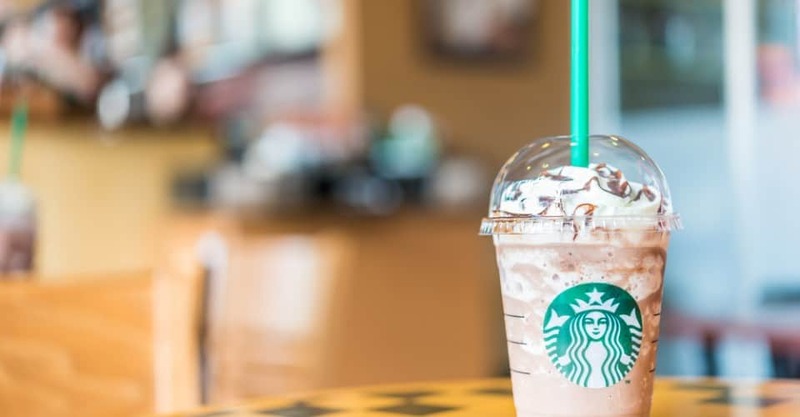 Starbucks also offers Iced Skinny Flavored Lattes, which use sugar-free flavored syrup; however, this means they contain artificial sweeteners, which you may want to avoid. The Evolution Fresh line of pressed juice / smoothies are certainly healthier than the fancy coffee drinks but are still high in calories and should not be considered thirst quenchers. That said, the Evolution Fresh Sweet Greens and Lemon looks very healthy, is only 50 calories, and is made with green vegetables, a squeeze of lemon, and apple. Keep in mind that you should always choose nonfat milk, which saves up to 120 calories. Forget the whipped cream – that’s another 50 to 110 calories. Also, keep in mind that Starbucks makes good plain iced coffee; get that with skim milk. Subway, the self-proclaimed healthy food chain, has mostly bottled or fountain sodas and drinks ranging from 310 to 620 calories. They also offer bottled water, coffee, apple juice (0 to 300 calories), low-fat milk (100 calories. per 8 ounces, which is not necessarily the full serving), chocolate reduced fat milk (200 calories per 8 ounces, again not necessarily the full serving), and Vitamin Water Zero (0 calories). Subway also has FUZE Iced Tea (typically 0 calories for unsweetened to 170 calories for sweetened and flavored). TB has Freezes, which are more dessert than beverage and range from 160 to 190 calories. TB’s iced tea is 200 to 250 calories. Best Bet: Ask for water. Panera has a very large beverage selection. Watch out for the smoothies­even the ones labeled “low-fat” have 340 calories, which is a meal, not a beverage. They also offer several high-calorie, low-nutrient frozen drinks, including a Frozen Caramel (600 calories), Frozen Mocha (580 calories) and Frozen Lemonade (240 calories). The coffee drinks are also high in calories: Iced Caffe Latte (170 calories) and Iced Carmel Latte (440 calories). Best Bet: I like the fact that Panera has several no-calorie teas, including Tropical Hibiscus Iced Tea, Mango Iced Tea, and regular iced tea. Watch out for the iced green tea (160 calories), chai tea (190 calories) and raspberry tea (190 calories). They also offer regular iced coffee (10 calories).